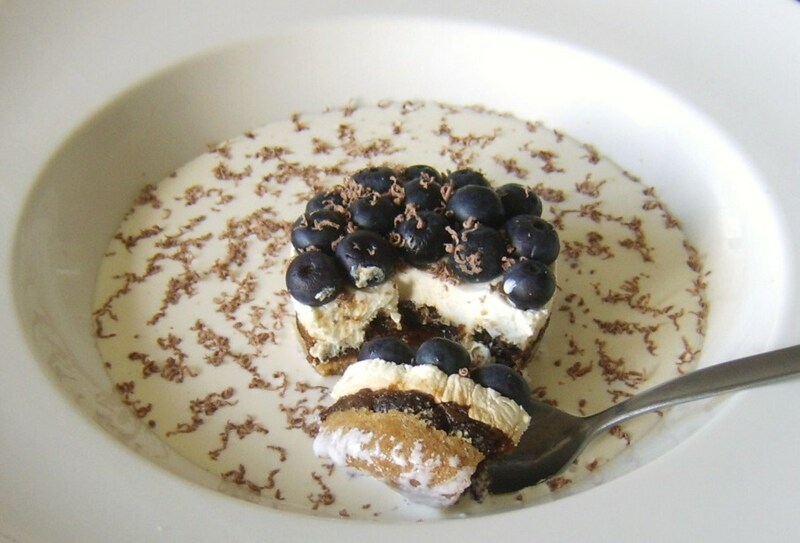 Blueberry cheesecake is a fairly popular and incredibly tasty dessert in its traditional and most basic form. 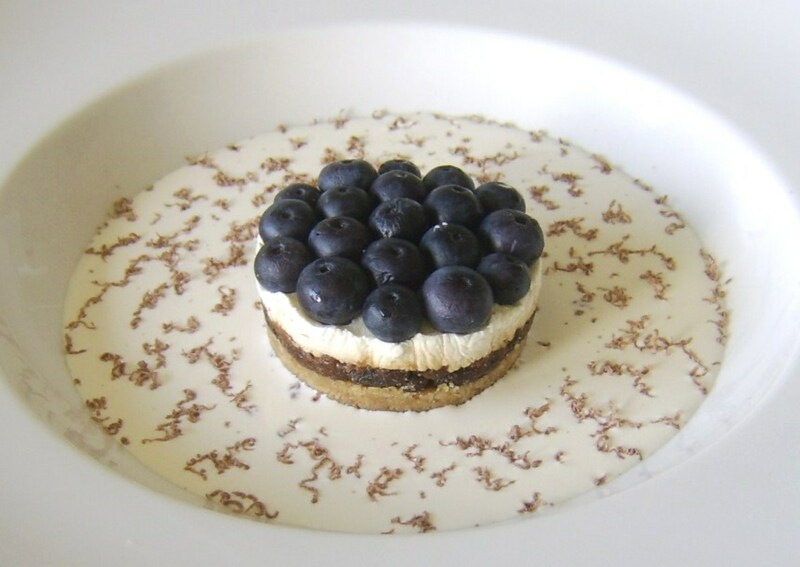 This recipe, however, features details of a perhaps unusual way to take a blueberry cheesecake to whole new levels of scrumptiousness. 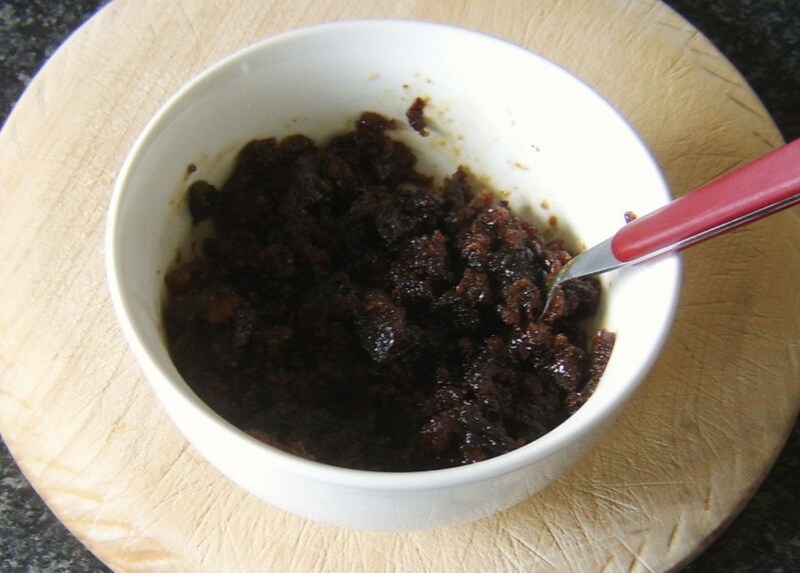 The recipe incorporates Christmas pudding, a rich, substantial and often boozy pudding widely enjoyed in the UK each year on or around Christmas Day. 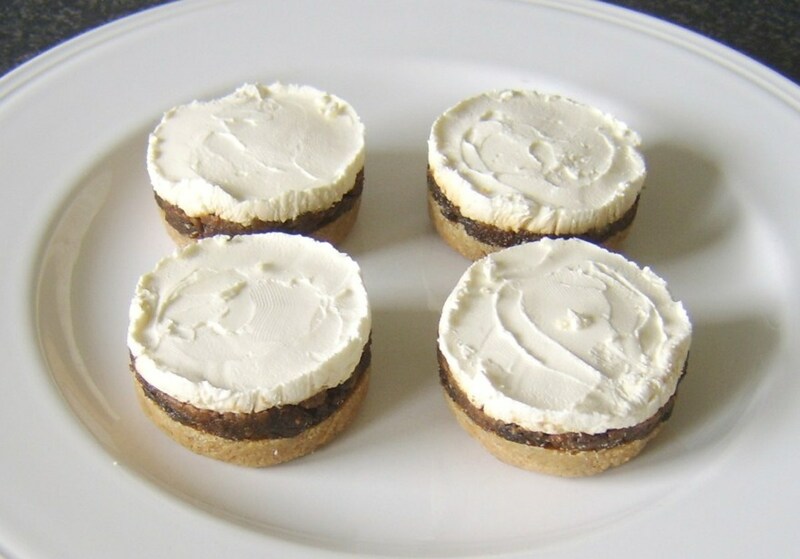 These cheesecakes can either be made with a Christmas pudding specifically made or bought for the purpose, or alternatively, they represent a great way of using up leftover Christmas pudding which may be crying out to be put to imaginative use in the days after Christmas. 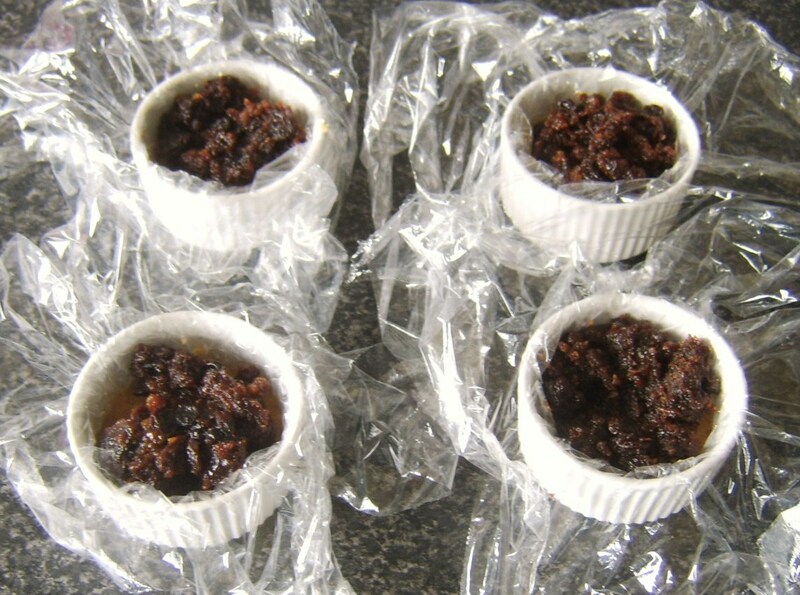 Note that because of the alcohol content, Christmas puddings have a long shelf life and do keep for a longer period of time than you may expect. This means they can often be picked up really inexpensively in the months of January and February in particular when supermarkets are looking to clear their shelves to make way for new seasonal produce. 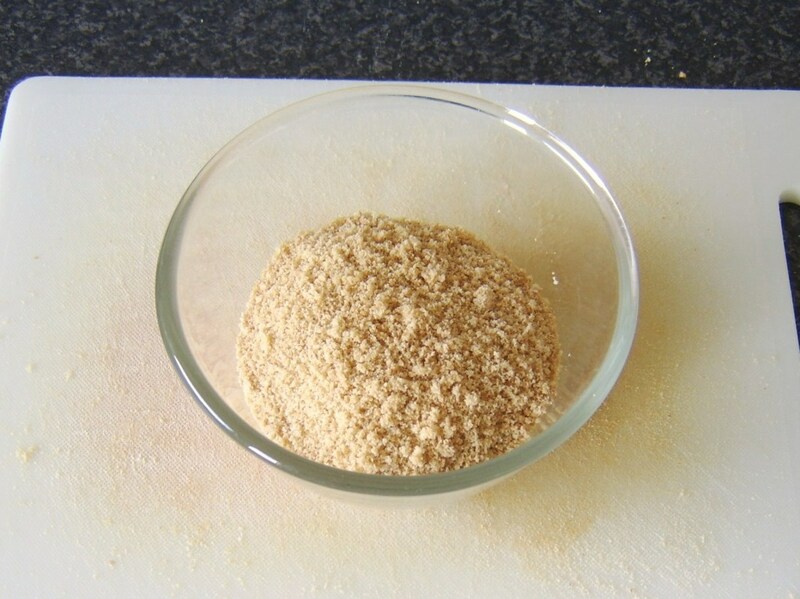 The nature of this recipe makes it incredibly difficult to give precise quantities for the ingredients. 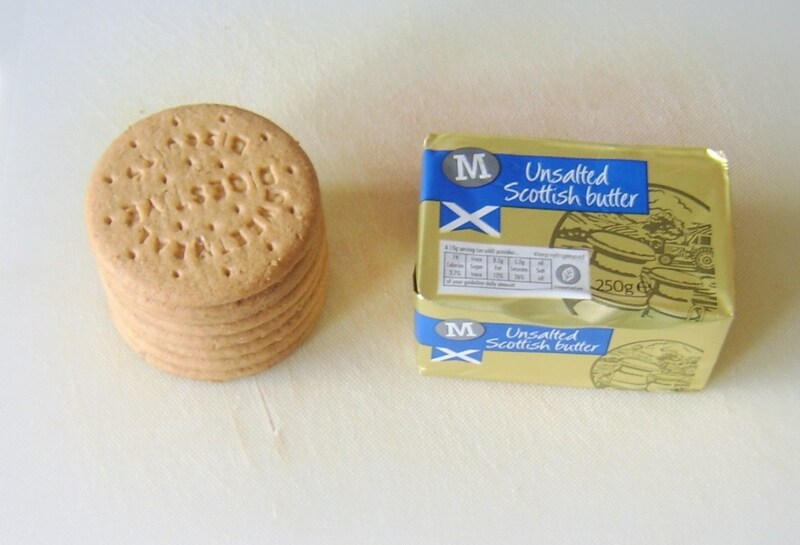 Factors like the size of your ramekins are of course a huge variable. 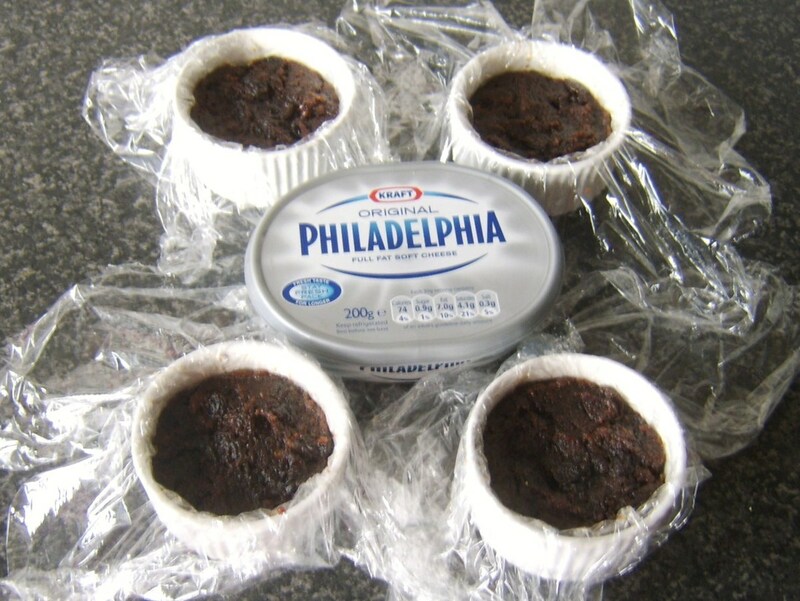 You can buy ramekins exactly like the ones used in this recipe online or simply adapt the ingredient quantities to suit whatever size you have available.What you may wish to do is make sure you have just a little bit extra of everything to hand just in case. 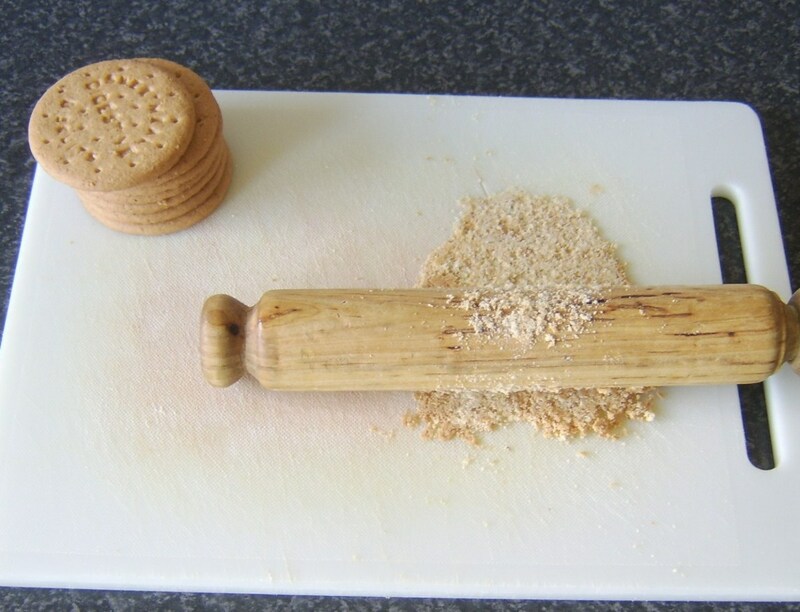 You can of course make the biscuits/crackers in to crumbs any way you choose but the way I do it is simply to roll them with a rolling pin, one or two at a time, on a large chopping board. 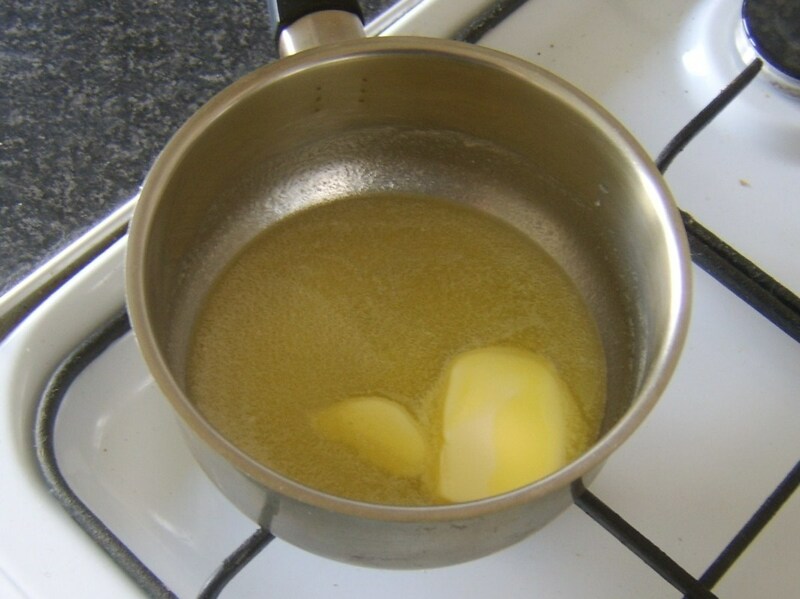 Melt the butter very gently in a large saucepan. You may be wondering how I get the assembled and set cheesecakes out of the ramekins. The answer is very simple. All I do is begin by lining each ramekin with a torn off piece of clingfilm/plastic wrap. 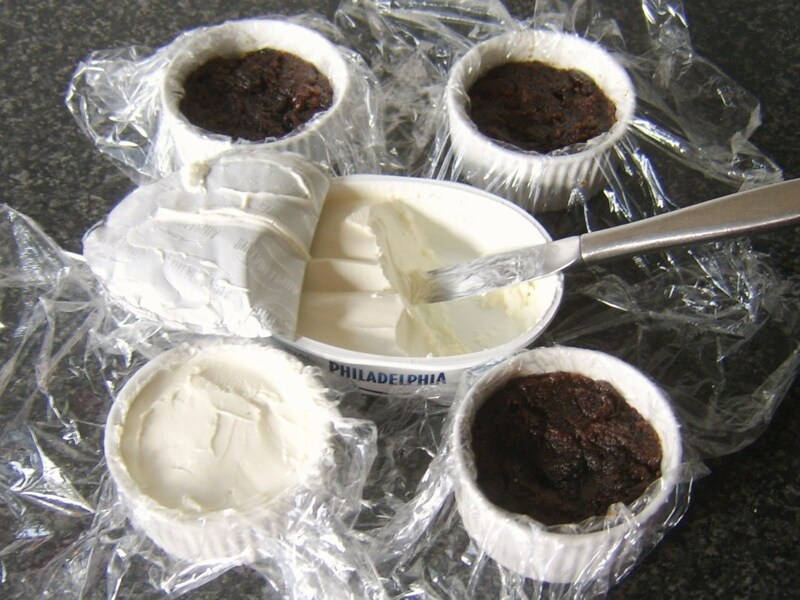 Make sure you have plenty of wrap overhanging the ramekins as this will be necessary to pull the cheesecakes free. 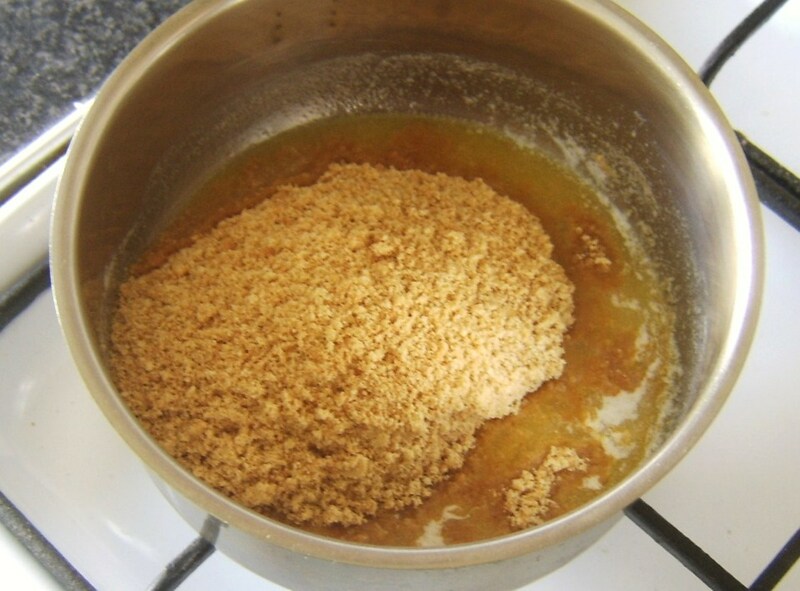 Add the crumbs to the melted butter and stir with a wooden spoon. 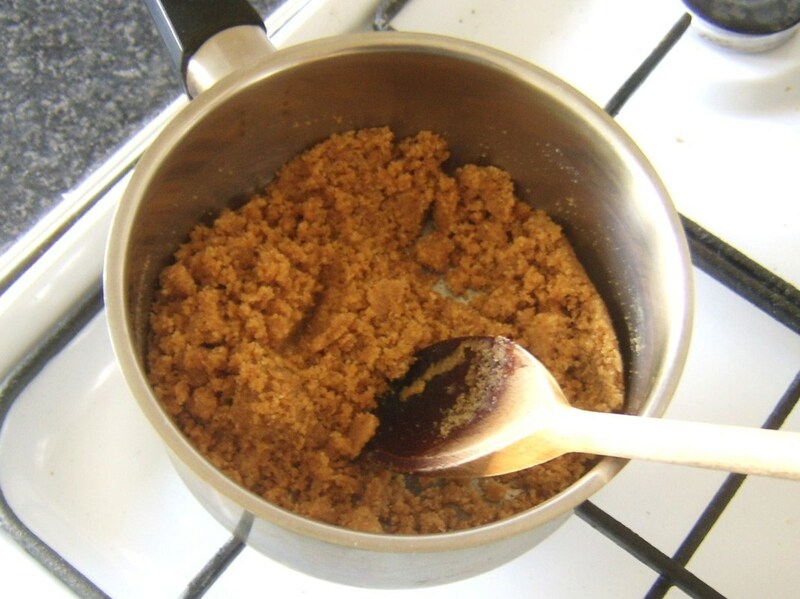 The mixture should be of a consistency where no liquid butter remains but the crumbs are evenly moist. Divide the mixture between the four ramekins and press down fairly firmly with the back of a teaspoon. 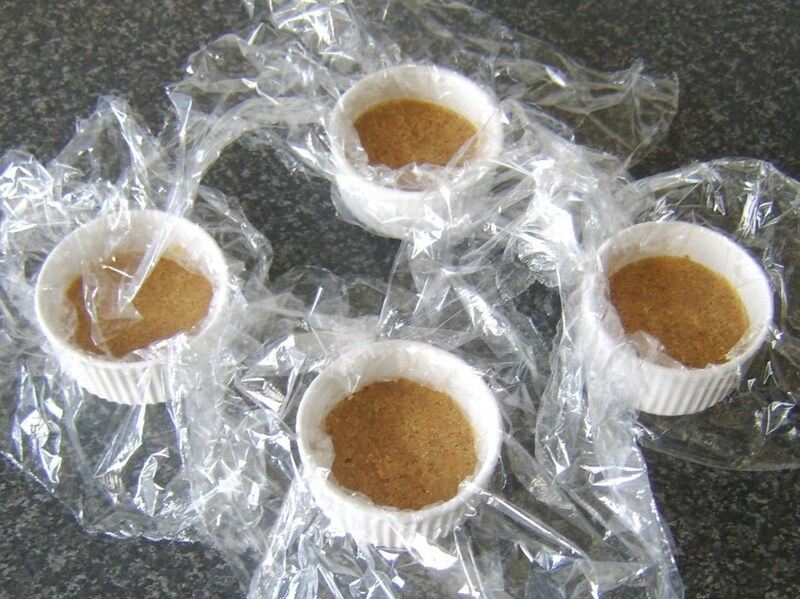 The ramekins should be roughly one third full when the mixture is compressed. 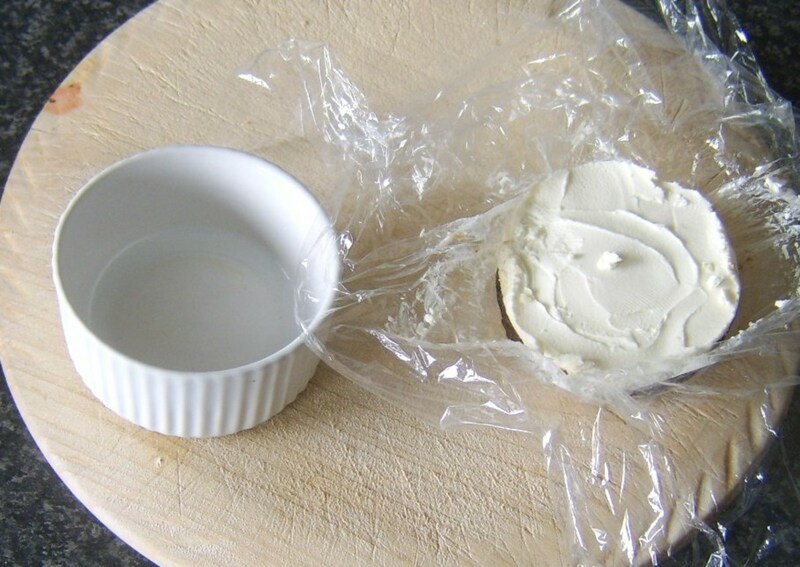 Put the ramekins in to your fridge for at least an hour until the base is cool and firm. 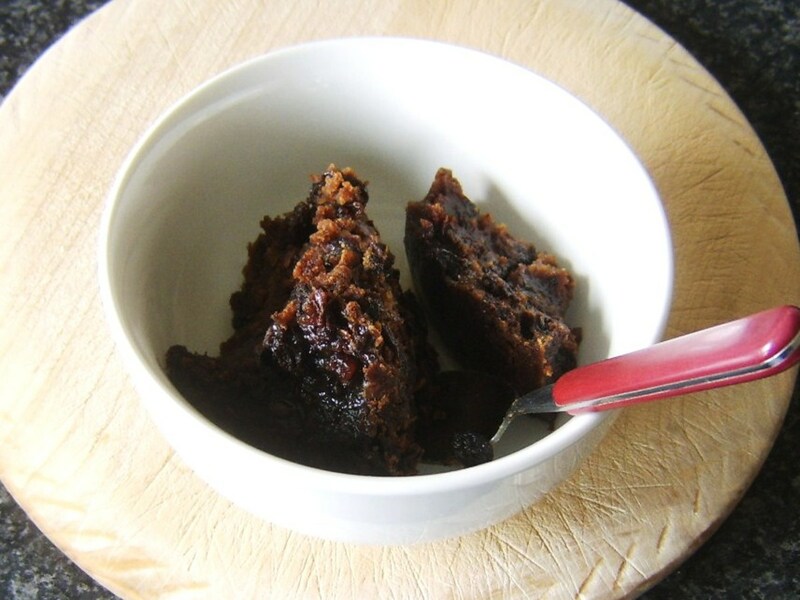 The alcohol in this Christmas pudding was a mixture of apple cider and brandy. 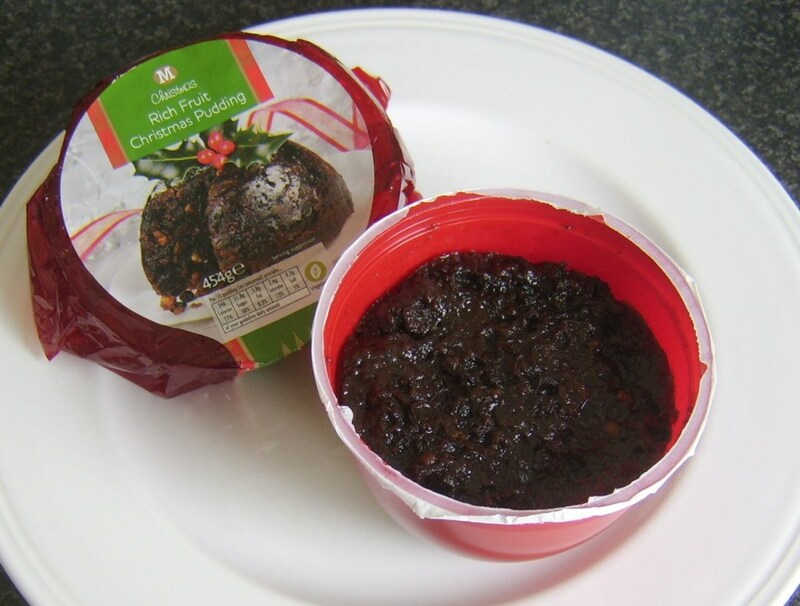 Spoon the Christmas pudding and the water in to a microwaveable bowl and heat for about a minute on high. 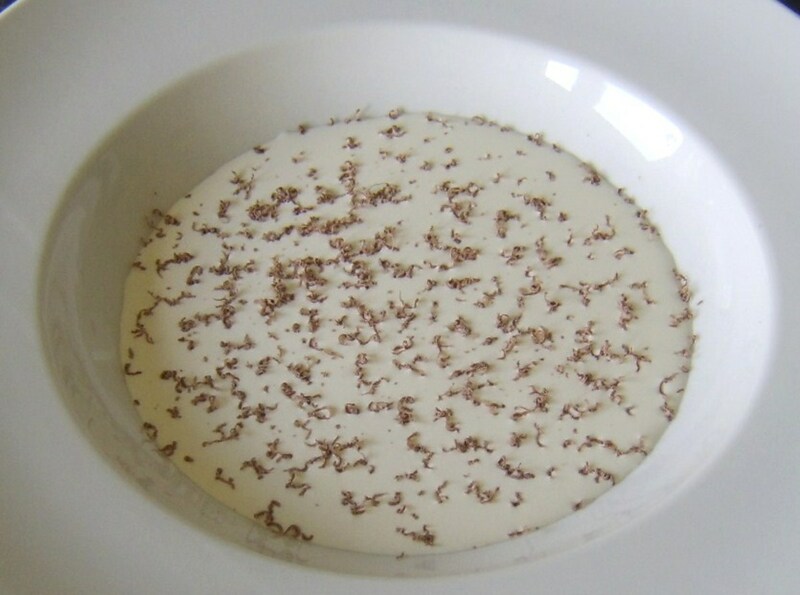 Take from the microwave, stir and leave for a couple of minutes or so to cool slightly. 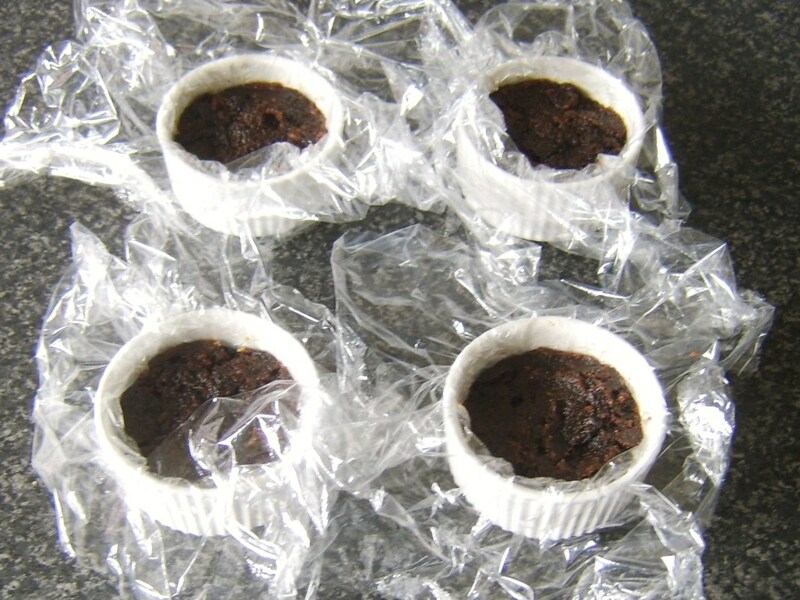 Remove the ramekins from the fridge, spoon in the Christmas pudding and compress as before, though not quite as firmly this time. The ramekins should now be about two-thirds full. Return to the fridge for a further hour. 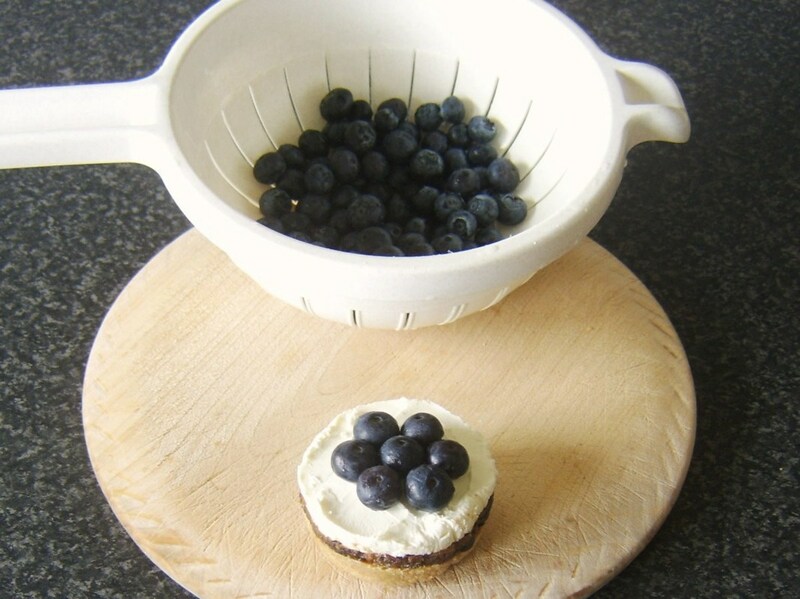 Use a teaspoon to fill the ramekins with cream cheese. Smooth level with a knife. 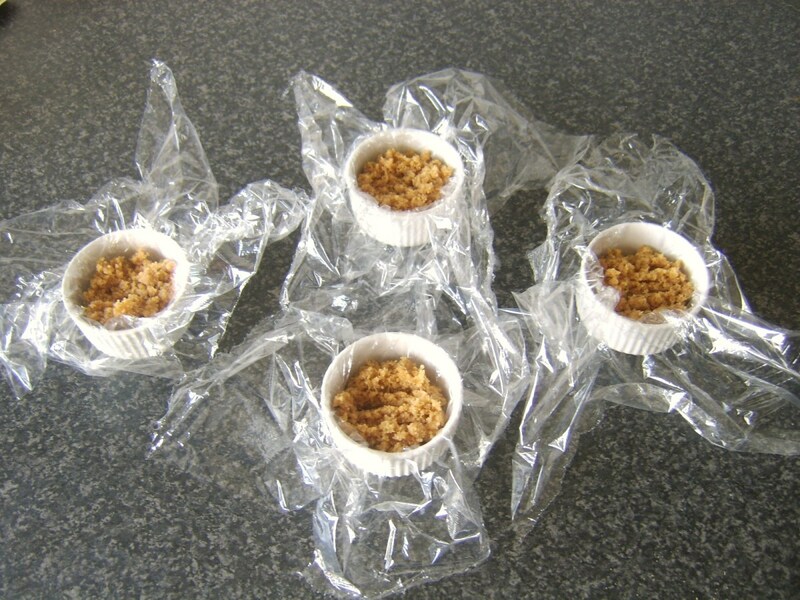 One at a time, carefully gather the edges of the clingfilm around the ramekins and gently but firmly pull the cheesecakes free. 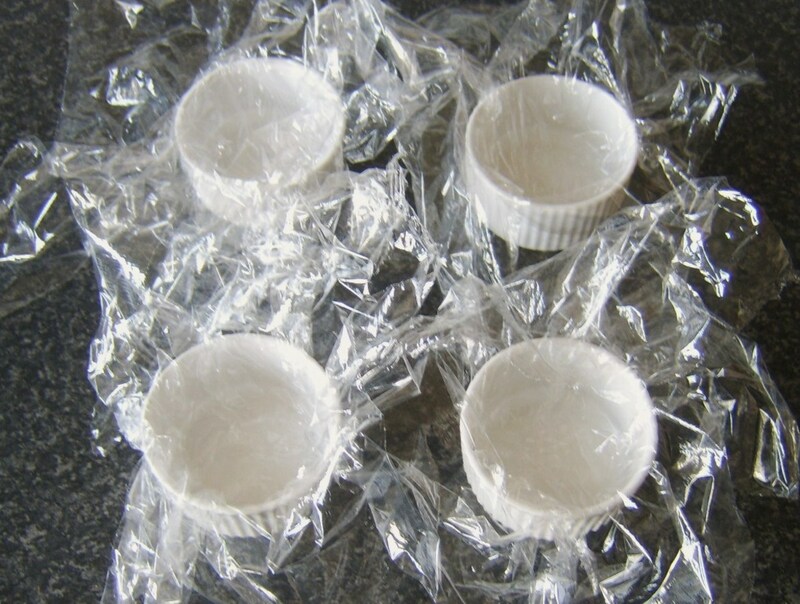 The clingfilm should then easily peel away. 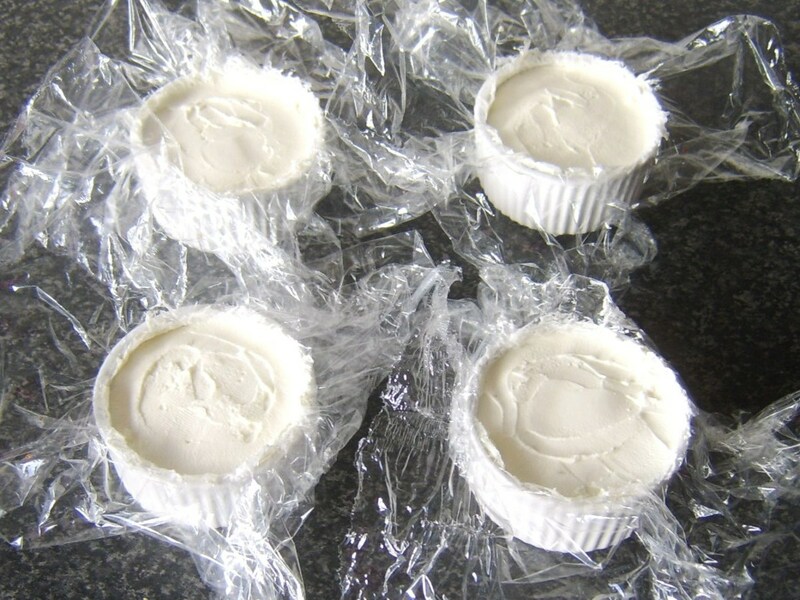 If you have caused the cream to bulge slightly at the edges by removing the clingfilm, simply smooth with a wide bladed knife dipped in boiling water. 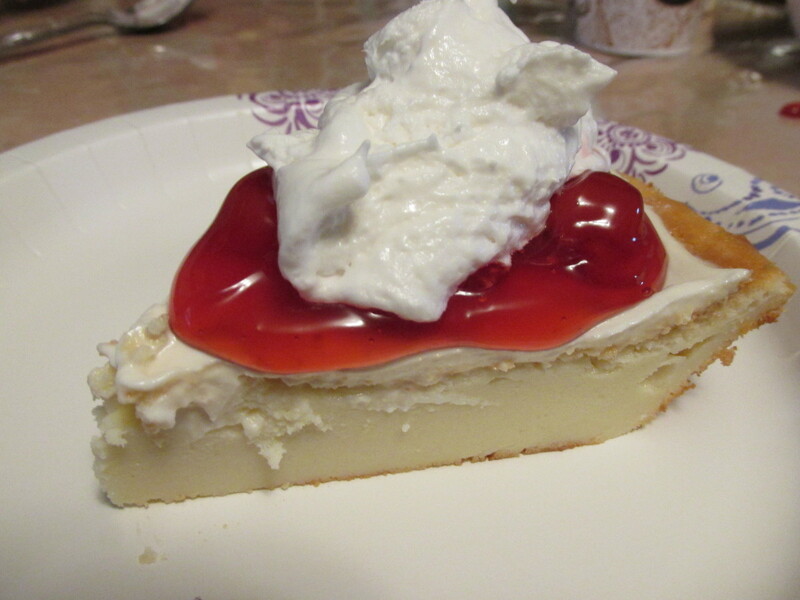 Sit the cheesecakes on a large plate, cover and leave them for fifteen minutes or so to come up to something approaching room temperature. Wash the blueberries thoroughly in cold water and shake dry in a colander. 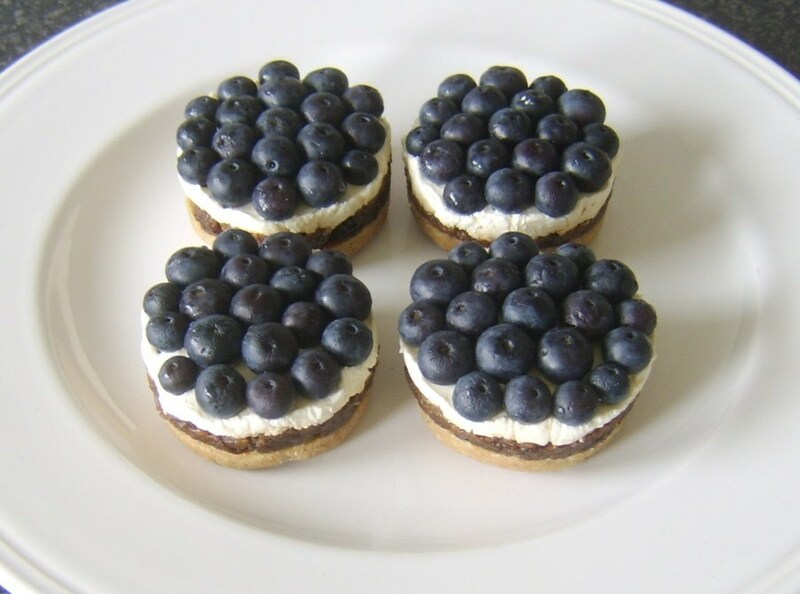 Do take a few minutes to evenly arrange them on top of the cream cheese to fully cover the cheesecakes in order to achieve best presentation. 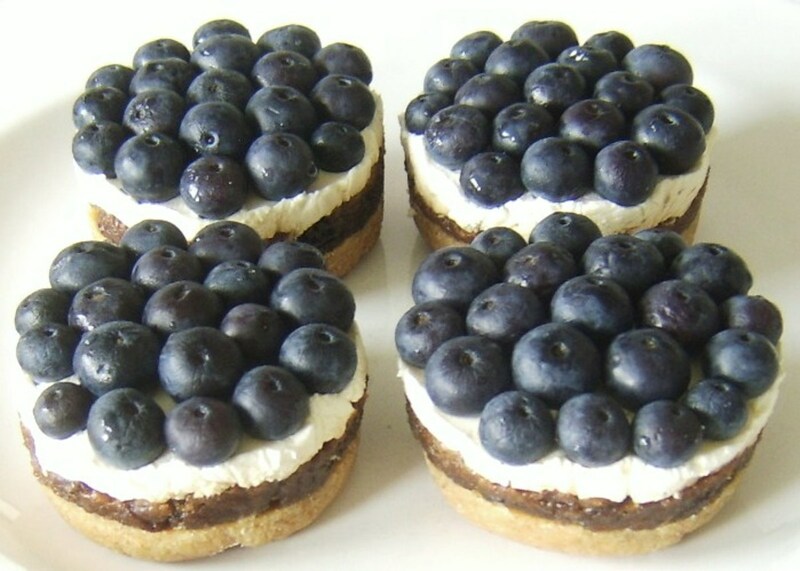 This is merely one serving suggestion for your Blueberry and Christmas Pudding Cheesecakes. 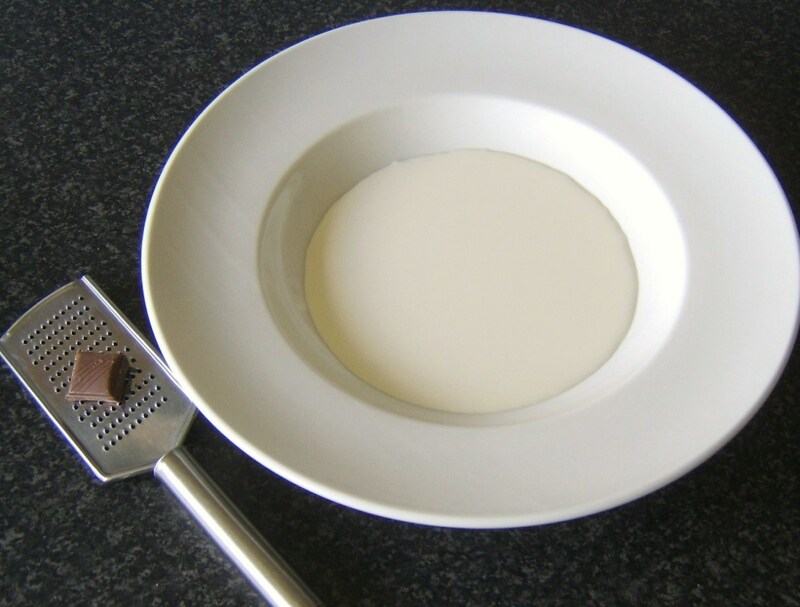 Pour some cream in to a deep plate to a depth of no more than half an inch. 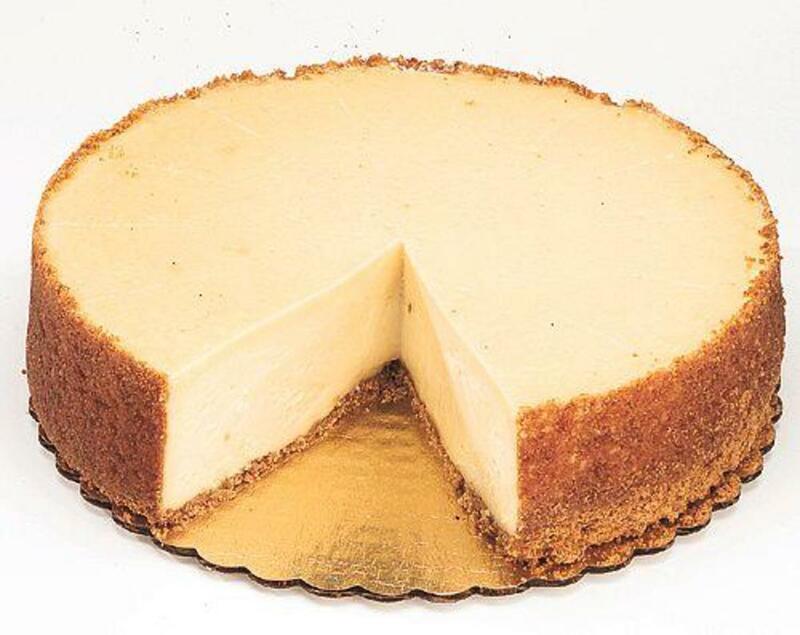 Grate over some chocolate and carefully sit a cheesecake in the centre. 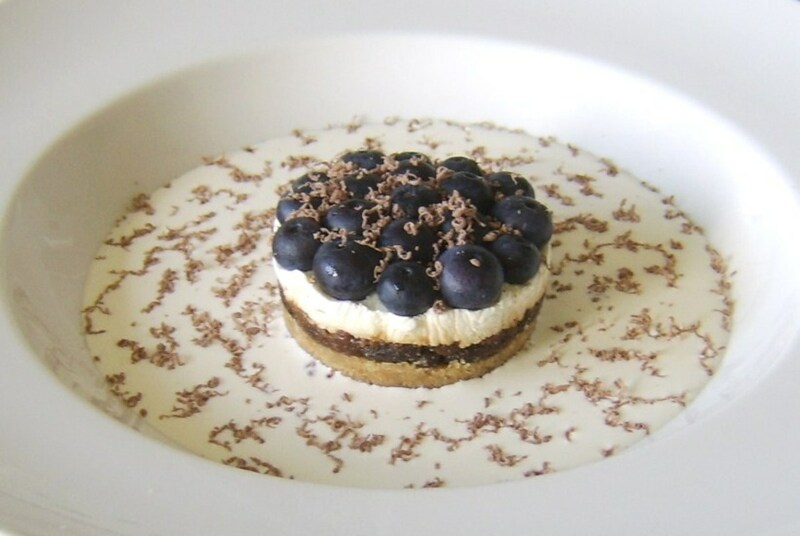 Alternatively, sit the cheesecakes in the cream before grating on the chocolate that it scatters the cheesecakes as well as the cream. 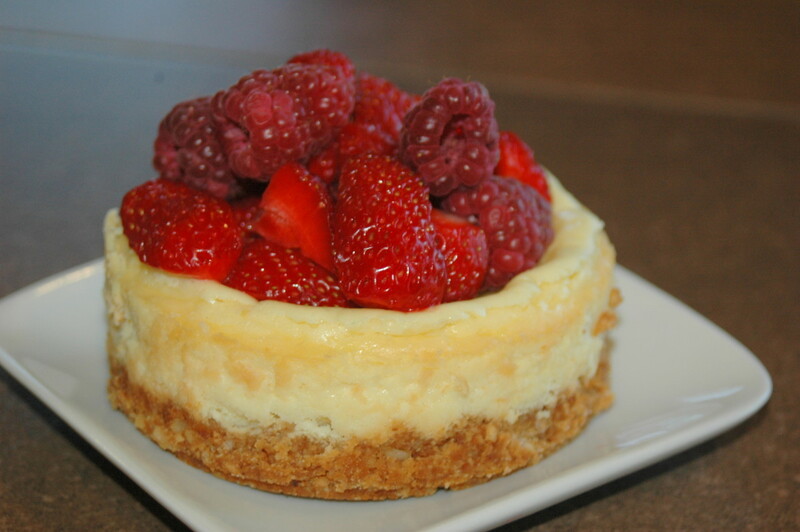 Are You a Cheesecake Lover? 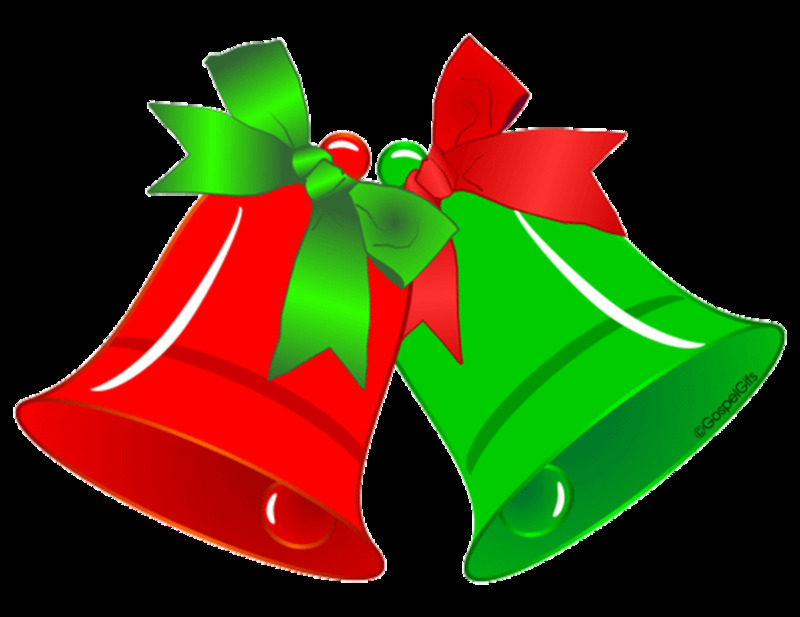 - Are you likely to give this idea a try? Hi, rmcrayne. SOrry to be so late in getting back to you on this. Have inexcusably neglected this account for too long. Thanks for the pin and I hope you get a chance to try out the idea. 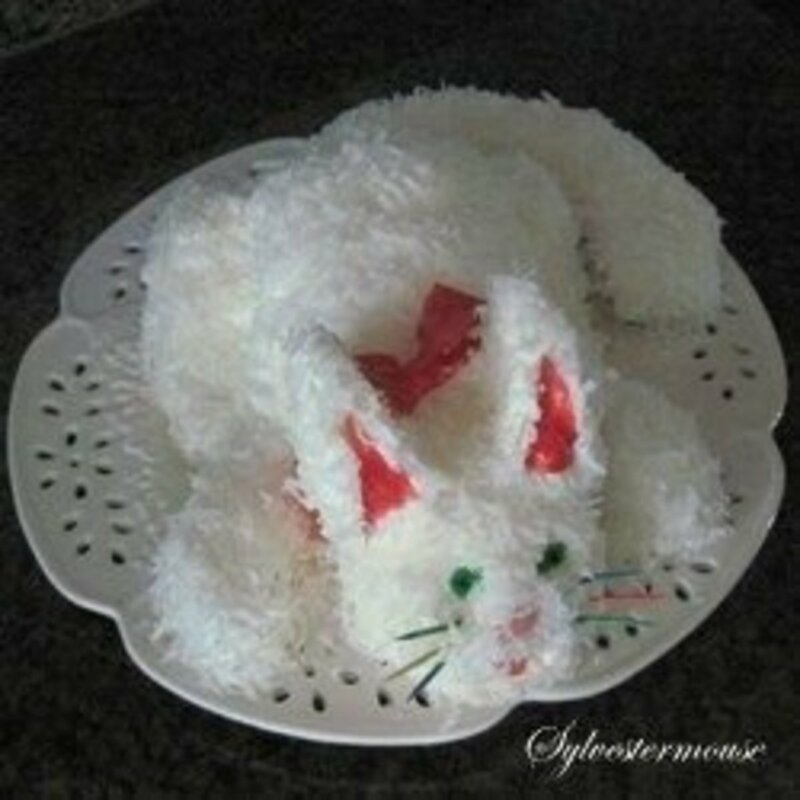 I just checked out your new HP acct and found this recipe. 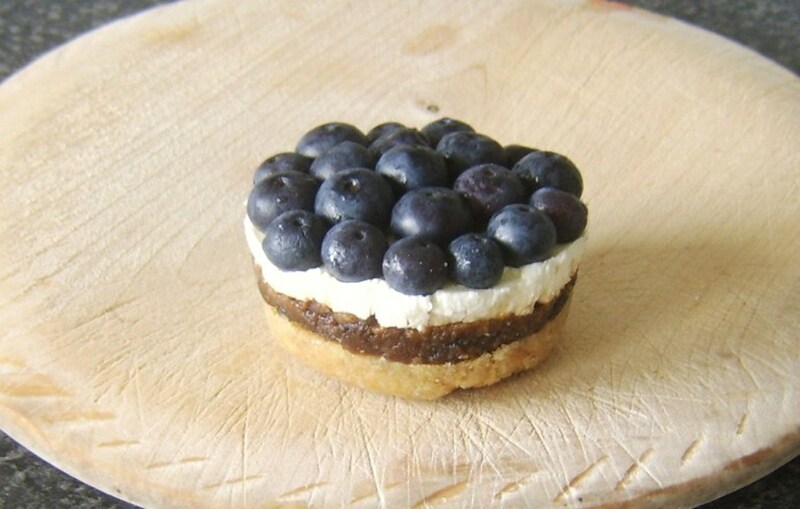 I've been making layered desserts to get some "pin-able" photos for a hub, so this recipe caught my eye. 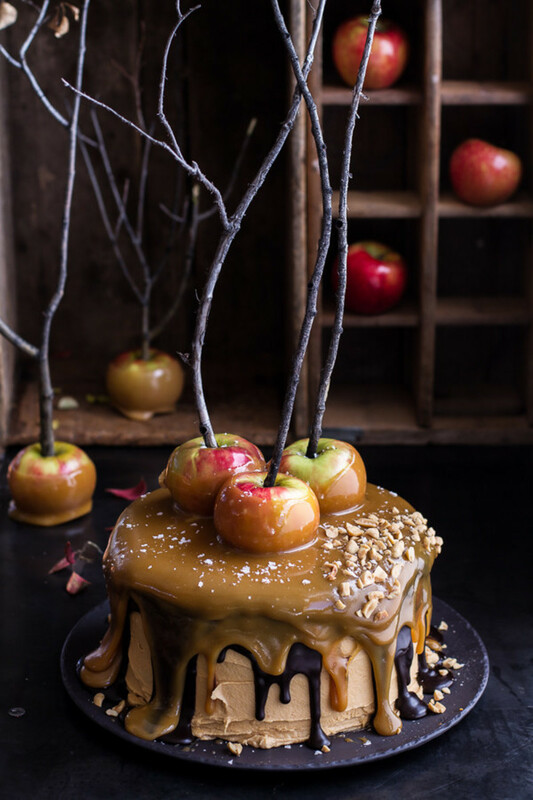 Just pinned this to my cold/no-bake desserts board.